Doctor Who: Revisiting Peladon | Warped Factor - Words in the Key of Geek. The Third Doctor's two visits to Peladon are notable for a number of reasons. 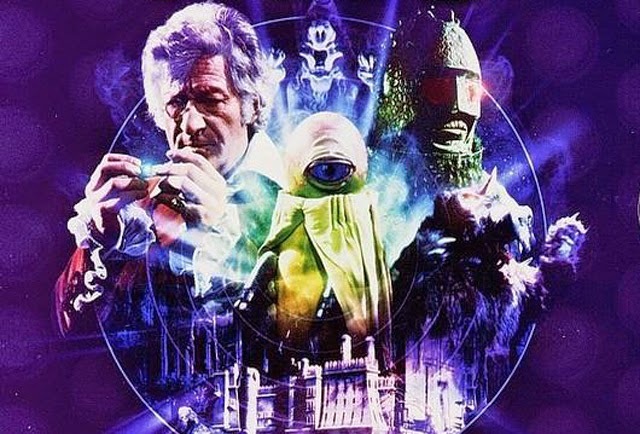 The Curse Of Peladon is one of relatively few early-ish Third Doctor stories in which Earth plays no part, a test flight in the now-repaired TARDIS taking the dapper begrudging UNIT employee & Jo Grant into the heart of intrigue within King Peladon's domain. DOCTOR: There you are, Jo. A perfect landing. JO: And about time too. DOCTOR: Now, now, Miss Grant. Let's not be impatient. JO: Impatient? Look, I'm all dolled up. I'm all dolled up for a night out on the town with Mike Yates when you talk me into a joyride in this thing. DOCTOR: It's hardly a joyride, Jo. This is the TARDIS' first test flight since I got it working again. JO: Yes, I know, but you said we'd only. You said we'd only be a few minutes, right? DOCTOR: One minute, Jo. Routine landing procedures first, eh? Let's see what the scanners have to tell us. DOCTOR: Must be on the blink. JO: I might have expected it. The TARDIS always is. DOCTOR: I hope you're as in good condition when you're as old as she is. Change might just be about to sweep through the kingdom as it seems Peladon might be about to join the Galactic Federation! The advisers to the young King are at loggerheads over the issue, with Chancellor Torbis firmly in favour and High Priest Hepesh defiantly against it. To that end he uses the royal Aggedor to stir up a bit of trouble, the Doctor getting chance to show off by singing it into a sort of hypnosis using a Venusian lullaby- nonsense lyrics popularly supposed to have been made up by Jon Pertwee himself set to the tune of the Christmas carol God Rest Ye Merry,Gentlemen. Predictably Torbis is the first to die! PELADON: I remember when you and Torbis first brought me to this throne room. HEPESH: At first you refused to sit upon the throne. You said that rightfully it could only be your father's place. PELADON: And then my mother, Hepesh. She smiled and placed my left hand in yours and my right hand in Torbis's. HEPESH: And together we made a boy into a king. PELADON: And now Torbis is dead. Even more shockingly going by their past appearances opposite the man the Doctor had been in The Ice Warriors & The Seeds Of Death, an Ice Warrior delegation including Lord Izlyr prove themselves valuable allies here after some divide & conquer tactics by Hepesh! To fit into the nobility of proceedings Jo has been presented as an Earth Princess..
IZLYR: Sit down, Princess. Why did you try to escape? JO: I was frightened. Can you blame me? IZLYR: So, Princess, you believe that we tried to kill Arcturus. JO: Well if you didn't, why was the missing servo-unit in your room? IZLYR: Perhaps you brought it here as part of your scheme to trap us. JO: But that's just not true! I. One of you must have tried to kill Arcturus. IZLYR: Nobody tried to kill him. IZLYR: To destroy Arcturus, the helium regenerator must be deactivated. JO: What about the unit? IZLYR: Merely sensor equipment. Disconnecting that only produces metabolic coma. JO: So it couldn't be fatal? JO: I'm sorry if I might have misjudged you, but the Doctor did say you were a race of warriors. IZLYR: We were once, but now we reject violence except in self-defence. JO: What about Ssorg's gun? This is supposed to be a peaceful mission. IZLYR: Unfortunately, in order to preserve peace, it is necessary to survive. JO: Well, if you didn't do it, who did? Who could benefit by it? IZLYR: Perhaps the Doctor will be able to explain. Fast forward 50 years into Peladon's future, and the Doctor will return to find the King's daughter Thalira ruling as Queen in the midst of an industrial power struggle. Once again an Aggedor- this one presented as the child of that which the Doctor had put to sleep in his first visit- is manipulated to the ends of those desperate to get their way. It's worth remembering that The Monster Of Peladon was written against the backdrop of the 1974 miners' strike. Trisilicate, a valuable mineral, is what's causing all the fuss! NEXOS: Your Majesty, we people of the planet Vega are a practical race of mining engineers. We do not propose to accept that this unfortunate incident was brought about by supernatural means. THALIRA: The miners of Peladon say that Aggedor appeared to them. NEXOS: Your Majesty, your miners are primitive and superstitious. ORTRON: Then what is your explanation? ORTRON: And where are these saboteurs? ECKERSLEY: Yes, well, sabotage or spooks, the end result's the same. We had just about persuaded your miners to accept the use of the sonic lance and now they won't touch any of the modern equipment. "Industrial action began on 12 November, and the Cabinet immediately announced a national emergency. The Cabinet met the NUM leadership on 28 November, offering pay and other concessions that were refused." "With only 37 percent of the vote, the Wilson government took office under very grave circumstances for a badly divided ruling class. The Tories had been broken by the collective power of the rank and file; the law had been openly defied and the state defeated by workers' unity in struggle. Expectations were high. During the election campaign Socialist Worker sales rose dramatically. There was still a state of emergency and a miners' strike. Wage settlements were climbing towards 20 percent and the oil crisis was driving up inflation which had already reached unprecedented levels." Thankfully for the Doctor he would never have to cross swords with Arthur Scargill!